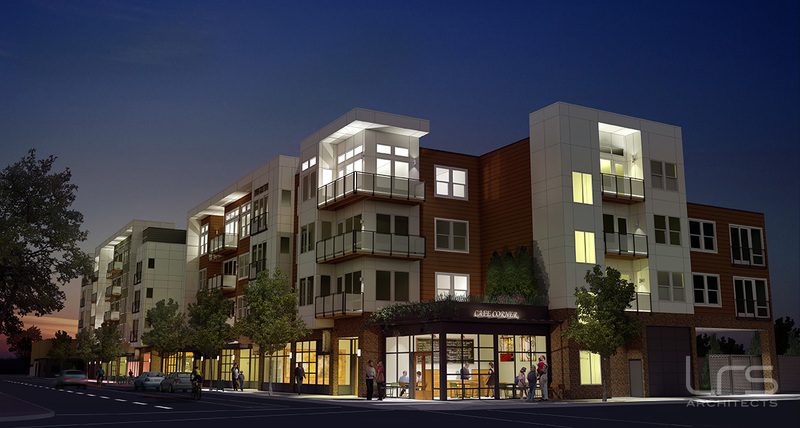 The Mason Williams, a 5 story mixed use building, is nearing completion in the Boise neighborhood. 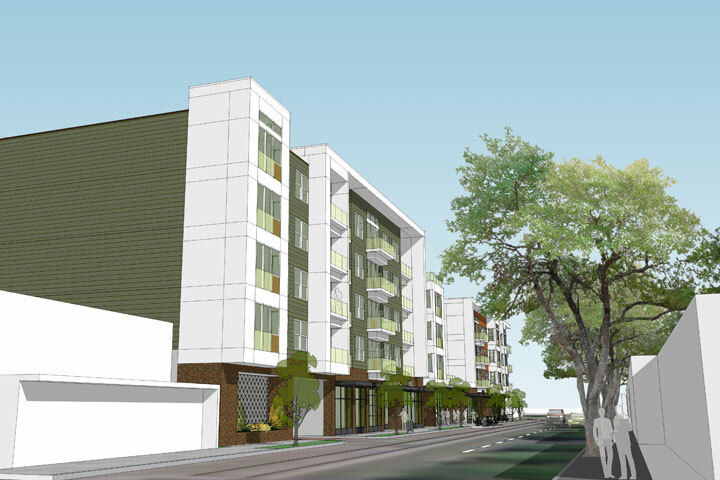 The project includes 76 residential apartments, 6,421 sq ft of ground floor retail, parking for 62 cars and 114 bike parking spaces. 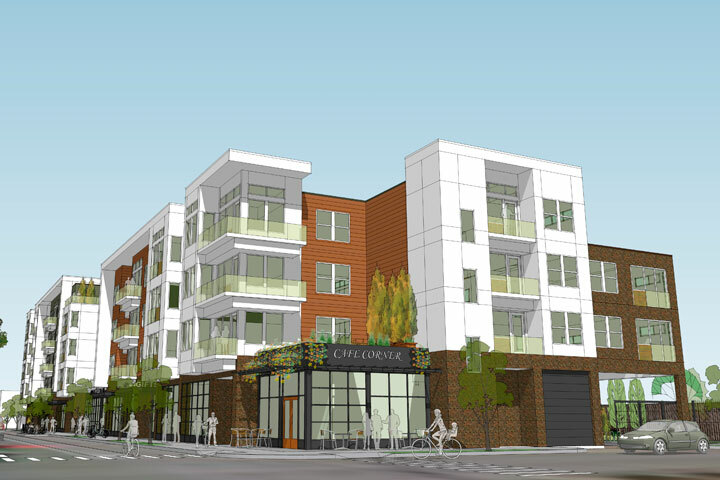 Four rooftop decks are provided for the use of the residents. The project design is by LRS Architects for development firm Ruben J. Menashe, Inc. The building occupies almost all of a 400′ long half block facing N Williams Ave. The massing is broken down into two primary volumes: a 5 story north building; and a 4 story south building. These are linked by a two story section at the main residential lobby. Exterior materials include brick, white fiber cement panels, and red or olive green fiber cement lap siding. Metal storefront windows are used at the ground floor, and fiberglass windows at the upper floors. 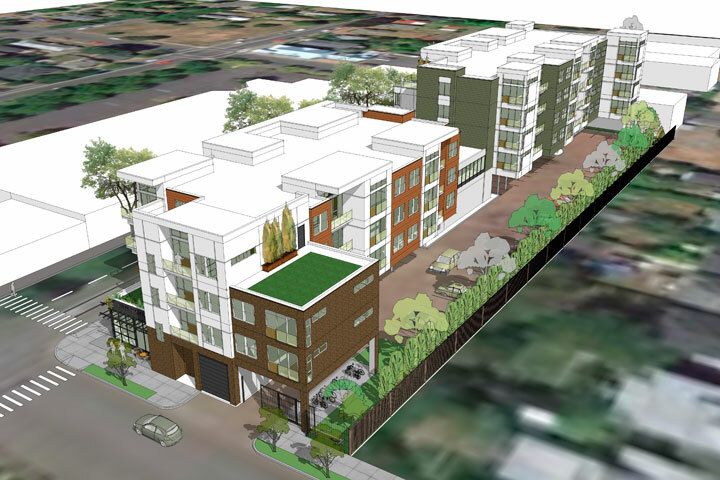 The site at N Williams Ave and NE Mason St, seen below in 2011, was previously vacant land. 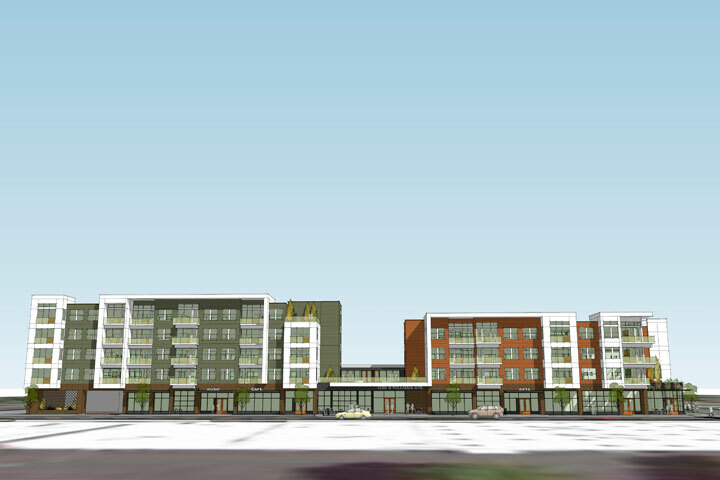 The applicant has proposed a large new mixed-use apartment building on a long north-south block abutting the bustling Williams Avenue corridor, in the Boise Neighborhood. 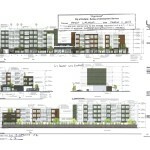 Originally proposed as a single 4-story volume facing Williams almost 350’-0” long and wrapping the corner at Mason Street, the project has been revised in response to neighborhood and staff concerns to break down into two primary volumes, with a five-story building on the north end, a two-story break at the main entry lobby, and a four and three-story building on the south end. 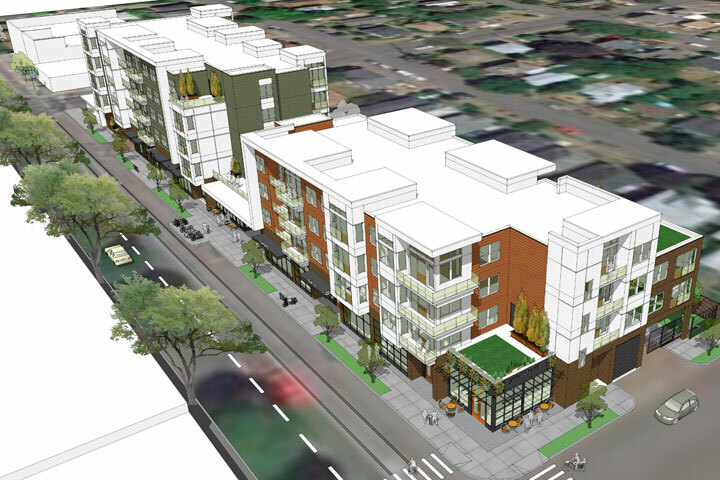 The five-story scale of the building is unprecedented along this street at this time, but the scale is not significantly different than other recently-constructed buildings in the Albina Community Plan area, and complies with today’s Central Employment (EX) base zoning. 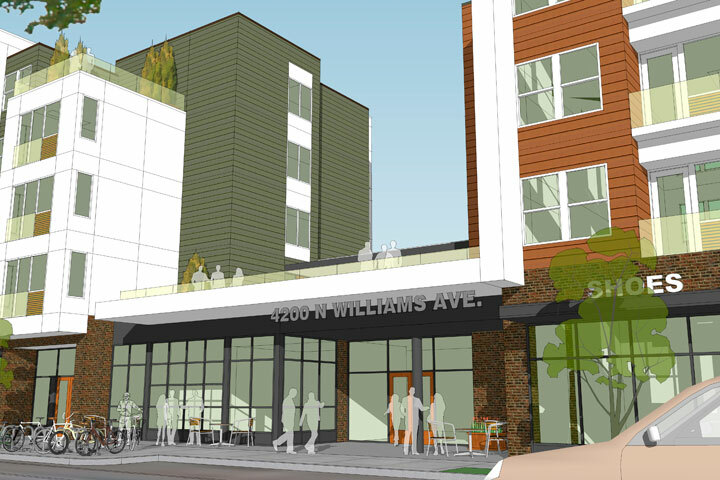 The project uses an attractive palette of durable materials, creates a dynamic, pedestrian- friendly, urban streetscape along N. Williams, and features attractive custom-designed fencing, extensive landscaping at grade and on the rooftops, and new retail space in addition to apartments in an area of the City experiencing high rental demand. As proposed, including a loading modification and exception to the oriel window standards, the proposal is able to meet the relevant design guidelines and criteria and should be approved. A subsequent Design Review was approved [PDF] in March 2013. A number of minor changes were made to the design, including simplification of the material palette. Only one letter of support was received. 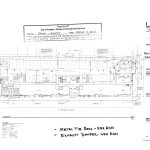 A building permit was issued in June 2013, and construction began shortly afterwards. This entry was posted in Boise, LRS Architects, Ruben J. Menashe Inc, The Mason Williams. Bookmark the permalink.